An European Defence Agency (EDA) initiative with its member nations to acquire a Multi Role Tanker Transport (MRTT) aircraft led to the NATO Multinational MRTT Fleet (NATO - MMF) program, see background below. Airbus Defence and Space was selected to deliver its A330MRTT aircraft which within the MFF program has been designated KC-30. Currently eight aircraft are on order with the contract providing an option for a further three aircraft. Within the EDA initiative The Netherlands was the lead nation which will see all aircraft being registered in the Dutch military aviation register thus receiving a Royal Netherlands Air Force serial and roundel. However the aircraft will be owned by NATO with OCCAR (Organisation Conjointe de Coopération en matière d'Armement / Organisation for Joint Armament Co-operation) responsible for the acquisition phase and the first two years of operations. After these two years the NSPA (NATO Support & Procurement Agency) will be responsible for the life-cycle management of the weapon system. Until now five EDA members have decided to join the program resulting in the purchase of the eight aircraft. Country 1st order 2nd order 3rd order Option Tot. The KC-30 is based on the commercial A330.200 and its build at the Airbus plant in Toulouse, France and then flow to the plant at Getafe (Madrid), Spain to be converted to MRTT. NATO MFFs first aircraft was delivered to Getafe in October 2017. 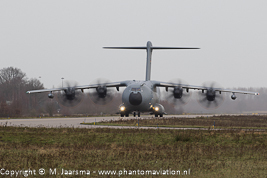 After completing its certification flights the aircraft will be used for training until May 2020 when it will be delivered to Eindhoven Air Base. 'M-001' flown to the United Kingdom for painting at the end of November 2018. Aircraft will be used for extensive test and training flights prior to its delivery to Eindhoven in May 2020. 'M-002' will be flown from Toulouse to Getafe in February 2019. It's expected that the European Air Transport Command (EATC) will plan and execute the missions for the KC-30 fleet. The contract contains an option for a further three aircraft allowing for one or more other countries to join the program. Both the Czech Republic and Spain are interested to join and are negotiating their participation. The Czech Air Force would take 150 flights hours. The Spanish Air Force is known to have an interest in the A330MRTT as replacement for the already retired B-707 tankers. With the international cooperation to purchase a new MRTT more tankers will become available. 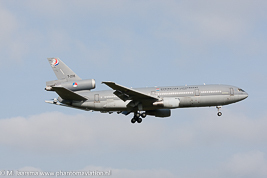 The KC-30 will replace the German Air Force A310MRTT and Royal Netherlands Air Force KDC-10. Except the Air-to-Air refuelling role the KC-30 will also be used in the medical evacuation and passenger transport role. 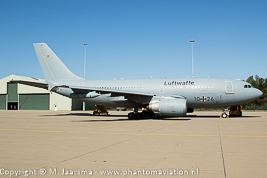 The German Air Force operates a fifth A310 which is dedicated to transporting personnel and cargo while one of its MRTTs is operated in the medevac configuration role. The NATO Multinational Multi Role Tanker Transport Fleet (MMF) program originated from an European Defence Agency (EDA) initiative aimed at the shortfall of Air-to-Air Refueling (AAR) capability in Europe. During international operations, Libya and Kosovo, several European (NATO) countries were depending on USAF tankers (KC-10A, KC-135R/T) to refuel their fighters. From 2012 the EDA worked on three projects: optimalization of exiting AAR refueling assets, optimization of the A400M AAR capability and the strategic tanker capailibty (MRTT program). AAR became one of the four key capabilities for the EDA. Most visible during the annual organized European Air Refuelling Training Exercise (EART) exercise. The first edition was held in 2014 with one of its topics standardization of processes. The European Air Transport Command (EATC) is one of the key organizations within this pillar. EDA focusses on the acquistion of AAR pods reducing the need for additional aircraft but increasing the amount of available tankers. During 2016 Airbus Defense and Space started the delivery of A400Ms equipped with hose and drogue under-wing refuelling pods. Earlier delivered A400Ms were already manufactured with the equipment and software allowing for a quick reconfiguration of the aircraft to a two-point tanker. Refuelling can also be done through the centerline Hose and Drum (HDU) unit. German AF A400M equipped with the hose and drogue under-wing refuelling pods. Close up of the refuelling pod on the right wing. The MFF program kicked-off in 2014 with The Netherlands taking the lead. Both Boeing with its KC-46A Pegasus and Airbus Defense and Space with its A330MRTT were invited to submit their bids. A year later it became clear the A330MRTT was selected as preferred aircraft and would receive an offer for proposal. At that time four aircraft were planned with three to be ordered by The Netherlands, Norway and Poland with one option for an additional aircraft. Luxembourg and The Netherlands placed the first order for two aircraft in 2016. Both will be delivered in 2020 and replace the two KDC-10s currently operated by 334 squadron. Germany and Norway announced to join the MFF program during the NATO summit held at Brussel in 2017 resulting in a contract to purchase five aircraft in October 2017. The contract was also augmented to include an option for four additional aircraft. At the end of December the Belgian minister of defense announced the participating of Belgium. On February 2, 2018 the contract for this aircraft was signed. On January 23 an A330MRTT from Airbus Defense & Space ) visited Eindhoven AB for a briefing and viewing of the aircraft for staff and guest of the air base. It departed the next day back to Getafe (Madrid, Spain) where the A330s are converted to MRTT. 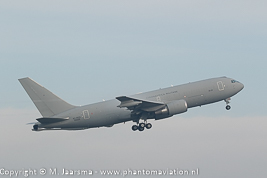 23-1-2018 Visit by an Airbus D&S A330MRTT to Eindhoven AB. 22-12-2017 Belgium announced to join the MFF program which will lead to one aircraft to be ordered. 25-10-2017 Five aircraft ordered by Germany and Norway with an option for up to four additional aircraft. Four aircraft will be based at Eindhoven Air Base, Netherlands and three at Cologne Bonn Airport, Germany. 29-6-2017 Germany and Norway formally join Netherlands and Luxembourg to operate pooled fleet Airbus A330MRTTs. 2016 Luxembourg joining MFF program with Belgium and Germany expressing their interest. 2015 Airbus selected to receive a request for proposal. 2014 Airbus D&S and Boeing invited to submit a bid for the MFF contract. 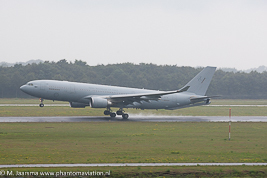 A Royal Australian Air Force A330MRTT (KC-30A) at Eindhoven AB, August 2014. 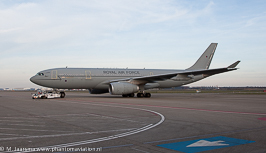 Royal Air Force Voyager KC.2 at Schiphol March 2015.